Good morning Nigel, reading a lot of good news here. The right name, improving health and now Canada. Wishing you a great and safe trip there. And beware of the lumberjacks over there. Woah you'll be on your way in no time at all! Good luck with everything and have a great day everyone! I have not been to bed yet. My left foot where the rash is decided to swell up like a football and was giving a very painful burning sensation. So I went To the hospital. The doctors looked at it and came up withe the conclusion of it being shingles! Let's see if the meds work and it gets better. I have just got my eTA approved for Canada for a six month stay. The eTA is a visa waiver that I needed to have. So I am all set to go now. Hope everyone has a good Thursday. (09-22-2016, 08:31 AM)The Survivor Wrote: I have not been to bed yet. My left foot where the rash is decided to swell up like a football and was giving a very painful burning sensation. So I went To the hospital. Treated you this morning, UK time, at about one o'clock. Treated your shingles about one hour ago. That's terrible, but you are being treated for it, so that is hopeful. I wonder if your immune system could use a boost. I am sorry to hear about your sleepless night last night and the rash causing you some important new problems. Good thing you went to the hospital if only they could come up with solutions that work. Anyway I hope there is some improvement with the swelling and it has gone down. I think I had posted a link about natural treatments for shingles some days back. I will look on the thread and see if I can find it and repost. Are you still thinking of making the trip to Canada as early as this coming weekend? I am happy to hear you have your travel authorization to enter the country. Wishing you a peaceful evening. I hope you had some good meals today. Wow, did you pay the insurance? You won't go without it, will you? What wonderful advice there from Madame Concorde! I would bring a bag of fruit + vegetables to eat if possible, and not eat any plane food; snack on cucumbers, strawberries, anything, and you'll still feel half-human at the other end. If not possible, I would take lots of bottles of real fruit juice. A flight really takes it out of you. Canada is lovely! I've been there, have relatives there. You'll love it once you get over the flight. And I'm sure the aptly-named Saviour and his wife will look after you. Keep us posted. At least you know what the rash IS, and can google remedies for it. I've heard it's painful, I hope it leaves you soon. Well that certainly was an interesting eventful day to say the least. First with the blood results. Platelets are at,309,000. Sodium level is at 34. But the sodium level has not yet stabalised it continues to fluctuate every day. Oh I am so happy that Canada is going ahead! I am also glad that your rash has been diagnosed - shingles can be a nasty bugger....keep a close eye on it. Well, wow, you little jetsetter - travel safe, take all our love and best wishes with you in your suitcase, and don't forget to pass some on to Saviour. (09-22-2016, 11:33 PM)The Survivor Wrote: Well that certainly was an interesting eventful day to say the least. First with the blood results. Platelets are at,309,000. Sodium level is at 34. But the sodium level has not yet stabalised it continues to fluctuate every day. I literally clapped after reading it! And hearing that the wheezing and rattling is gone...and hearing that you've got yourself ready to go to Canada. I hope the meds for the shingles helps out and helps quick! Good to see your new handle and that Grumpy is treating you! (09-23-2016, 12:09 AM)Little L Wrote: Oh I am so happy that Canada is going ahead! Thank you. I am not so sure it is shingles but then what do I know. The right foot has also become swollen! I have had shingles in the past, but my rash was only on one side of my body and confined to the side of my torso....it took months to actually shake it off. I didn't have any swelling though. Could it possibly be a combination of a reaction to the newer combination of meds and, I don't know, the very up & down weather temperatures? 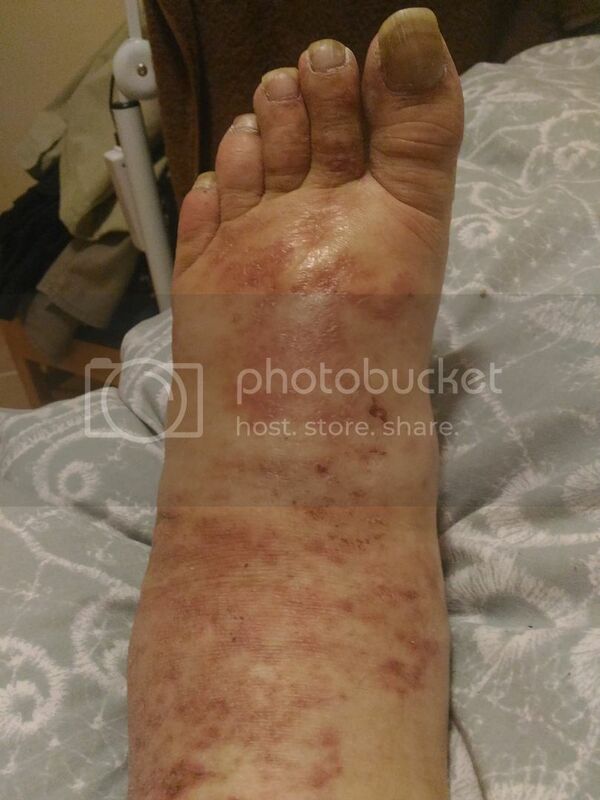 Here are some photos of that swollen left foot. 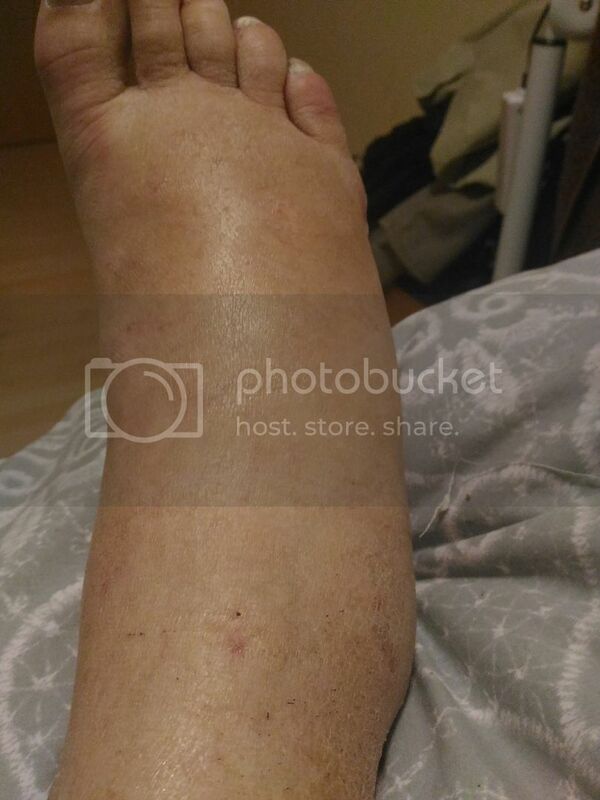 Also some of the right foot to show you the swelling there also. 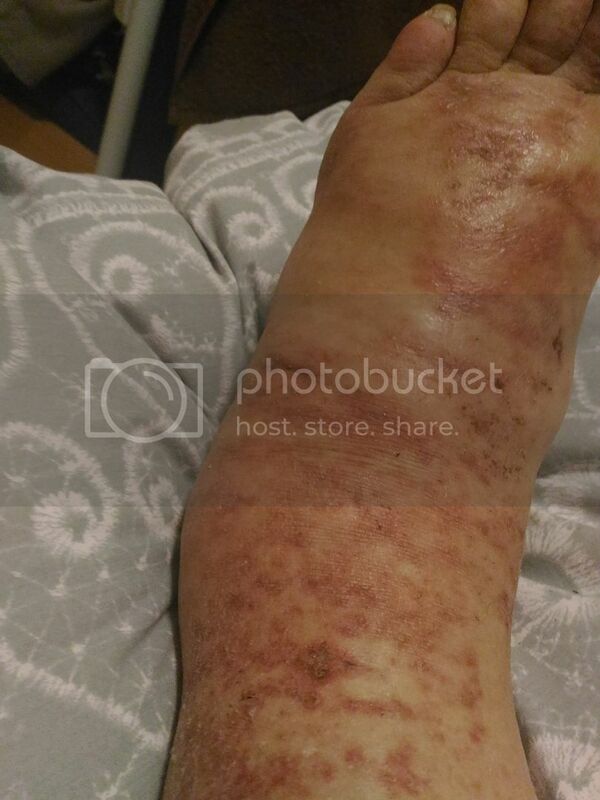 (09-23-2016, 12:34 AM)The Survivor Wrote: Here are some photos of that swollen left foot. 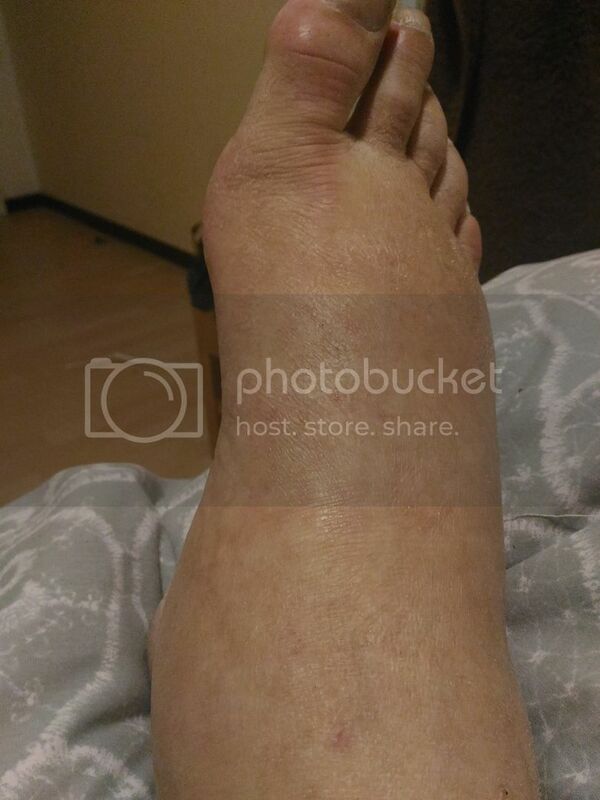 Also some of the right foot to show you the swelling there also. The chances on shingles on both sides are about zero. 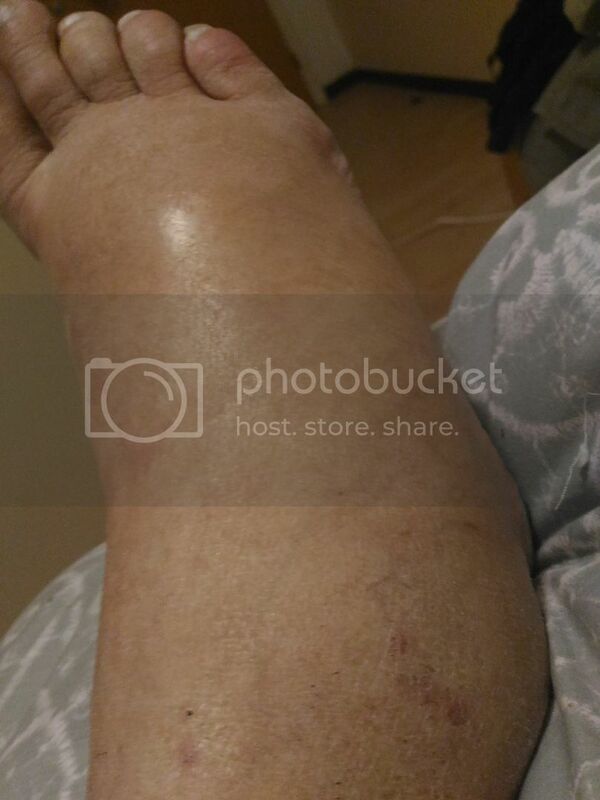 So the swelling has another cause, kidney failure or congestive heart-failure. Or just a reaction to those socks maybe? I am going back to the hospital I will post again when I can.